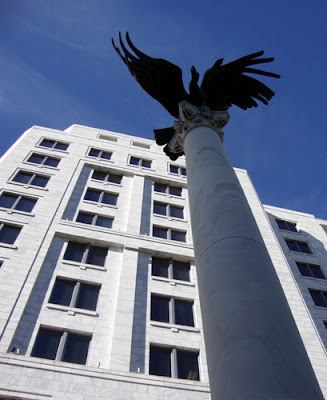 The Federal Reserve Bank Eagle (frequently called Eagle Statue) is perched atop a 48 foot marble column standing in the courtyard immediately in front of the Federal Reserve Bank of Atlanta. Award-winning artist Elbert Weinberg created the 3,300 pound bronze statue in 1964. The Eagle Statue was so important to the design of the Bank that the dedication of the new building was postponed until the statue could be delivered from Italy, where Connecticut-born Weinberg traveled to work on the statue. When the Bank moved to its newest permanent home at Peachtree and 10th Streets in 2001, the Eagle came along. Against a backdrop of the massive white marble Bank, the 9 feet tall, 16 feet wide dimensions of the statue comes out when you're closer to it. No-cost self-guided tours of the Federal Reserve Bank of Atlanta are available Monday-Friday 9:00 a.m. - 4:00 p.m. Very fine post. Thanks so much. I've always wanted to know. I enjoyed to downtown where it was a terminal vista and and now at 10th & Peachtree.